Memberz.Org – Available on Desktop and Mobile. Memberz.Org is a cloud-based community management solution built in Ghana for various organizations like Churches, School Associations and Alumni, Businesses and more, to help keep track of membership information, weekly contributions and communicate with members easily. SMS Messaging – Send single messages or Bulk messages using Dynamic Broadcast Lists based on demographic information with custom Sender IDs. Reports and Charts – Generate reports with a few clicks with print and export options. Role-based permissions – Create multiple roles to mirror your organization and assign granular permissions. Any member in your organization can be given a role to manage data. Online Member Registration – Allow members to quickly register with your organization via a URL and grow you database quickly. Advanced Reporting – Build your own custom reports using a visual query builder. Events – Creation, management and publication. Members will see upcoming events on their dashboard and mobile apps and can subscribe for updates or join. How is Memberz.Org different from other existing solutions? Most membership management platforms offer a semi-closed ecosystem where administrators have access to a specific set of data they upload or create themselves. With Memberz.Org, both organization administrators and members have a good set of tools to interact in a social manner. 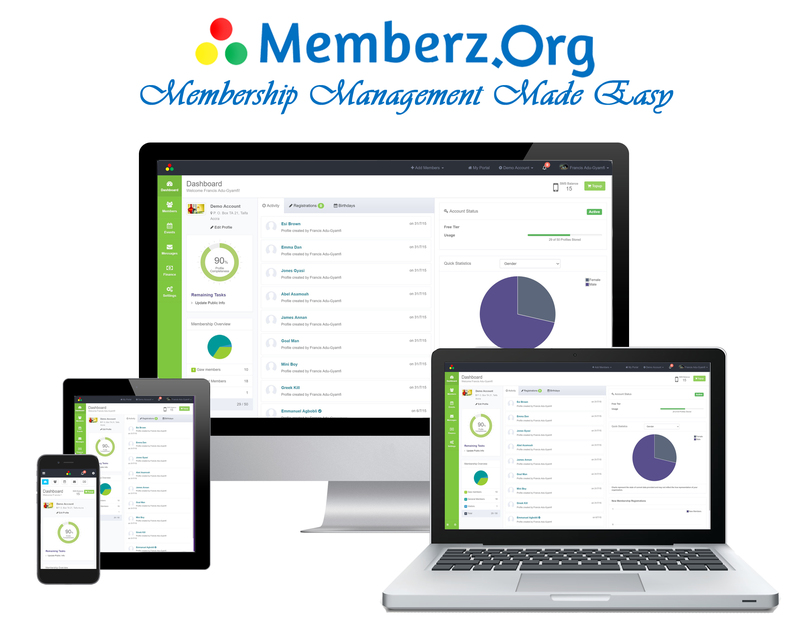 A person with a member account on Memberz.Org can belong to an unlimited number of organizations and track their activities across them all. Do I have to install the application? Similar to how Facebook, Yahoo and Gmail just work, Memberz.Org is a web-based service which is updated on a regular basis, so you will receive all new features and bug fixes immediately they are available. No physical installation required. Memberz.Org is not the first company to build a cloud-based solution so we are leveraging all the industry standard best practices for keeping your data safe in a cloud-hosted environment. From SSL Certificates, Data Encryption, constant data backups, to physical data center security, we are employing all the best practices to ensure your data is safe and easily accessible anywhere in the world. Member accounts on Memberz.Org are FREE and very small organizations like new church plants or small micro-savings and loans groups can operate free organization accounts with up to 50 members. Medium to Large organizations will pay monthly subscription fees for the service depending on the size of (number of members in) their organization. * Organizations that want to track over 5,000 members would need to contact our sales and technical support divisions to arrange for a dedicated installation to meet their needs. See below for contact addresses. ** Free/Bonus SMS Messages are tracked separately from purchased credits. Bonus SMS Credit does not rollover from month to month. Additional SMS Credits can be purchased in app. *** Prices are subject to change without prior notice. Receive 16% off when you purchase 6 or 12 months subscriptions any time before June 30th 2016. Yes. We actually recommend organizations start with our Free Tier plan to get accustomed to features first and work on setting up their environment. When ready you can upgrade to a higher capacity plan. Also, if you outgrow your current plan capacity before your subscription expires, you can upgrade to a higher plan immediately and receive a Prorated Discount for the new subscription.